So summer’s here, and the only predictable thing about the Irish weather is that it’s going to be … unpredictable. That said, there will undoubtedly be a few sunny days to go round, and many families will be jetting off on their summer holidays abroad, so how can we best keep our little ones safe in the sun? These days it almost goes without saying that it is vital to apply a high-quality, high-protection sunscreen to your children’s skin around thirty minutes before venturing out in the sun’s rays. Easier said than done, we know, when dealing with wriggling, giggling little octopuses, so thankfully there are a few products on the market developed specifically to make life easier for parents. Specially formulated coloured creams can both provide protection against harmful UVA and UVB rays, and the temporary green or blue colour will help show you which areas you’ve covered, and, more importantly, which you’ve missed. Water resistant lotions are always a good bet when heading to the beach or pool. Choose a high factor, reapply regularly (especially after swimming or sweating) and limit your children’s exposure to the sun. Just like yours, their skin will be dehydrated after a day in the heat, so select a product (after sun or moisturising lotion) that’s suitable for children and apply in the evening after bathing. We’re all at risk of developing heatstroke if our heads are uncovered. Children are no different, particularly those with very fair or fine hair, and especially babies with no hair at all! A hat is vital in the sun, so find ones that don’t fall or blow off easily in the wind (elasticated straps or safe ties for babies can help with exploring hands) and teach your older children always to wear them. Light coloured, loose clothing is best in the heat. 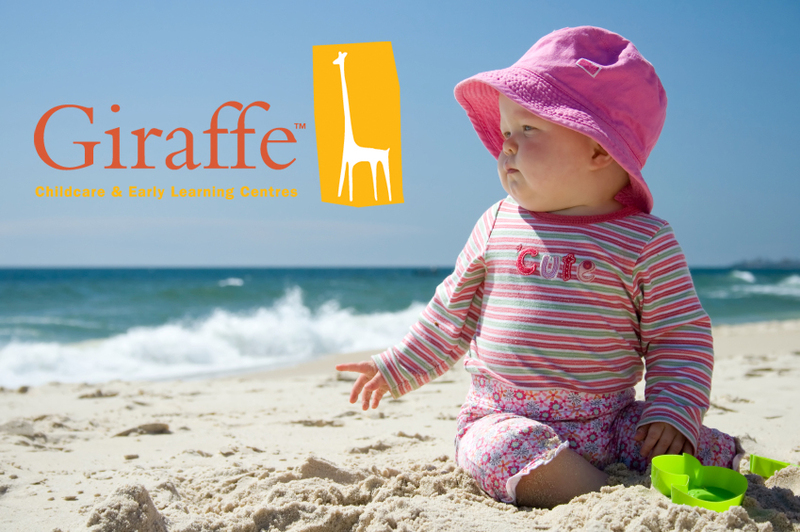 Keep little shoulders covered if your child is likely to burn and take a cover-up to the beach for unexpected breezes. There are many ranges of approved children’s sun protective clothing available, including T-shirts, wetsuits and swimwear. These offer waterproof UV protection of the equivalent of a 50+ sunblock and can offer peace of mind to parents worried about sun cream rubbing off as their children roll happily in the sand. Often families invest in little UV protected tents for beach holidays, which can offer youngsters a welcome retreat from the sun’s rays and help prevent burning skin and heat exhaustion. Water is just important, so take along several bottles and make sure the children keep topped up, as they’ll need to drink more than usual in the heat. Many parents pack a first aid kit to deal with life’s little bumps and bruises, and for sunny days this should include infant paracetamol in case of headache and calamine lotion to calm mild cases of heat rash. For more severe heat rashes, speak to a doctor or pharmacist, who may prescribe hydrocortisone cream. If you are concerned your child may be suffering from heatstroke, seek immediate medical advice. With all the above in mind, it can be daunting for new parents to prepare for hot weather, but it’s important to remember that a controlled amount of exposure to the sun is good for us, as it helps us absorb Vitamin D – essential for strong bones and many other health benefits. Above all, stay safe and have fun!